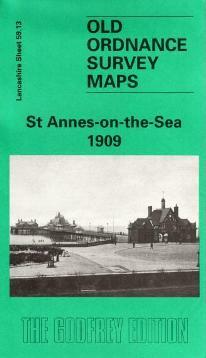 This detailed map covers much of the resort of St Annes, developed from 1875 by the St Annes-on-the-Sea Land & Building Company. In 1922 the town merged with Lytham to become Lytham St Annes. The map covers an area from North Promenade eastward to Fairhaven, and from Nelson Street southward to the coast. Features include the station, tramways, St Thomas church, pier, Grand Hotel, St George's Hall, golf links, Lawrence House. On the reverse we include adjacent sheet 67.01, showing a small area to the south, incl King Edward VII School. Also included is an 1897 LNWR railway timetable. The map links up with sheets 59.14 Lytham Hall and 67.02 Lytham to the east.